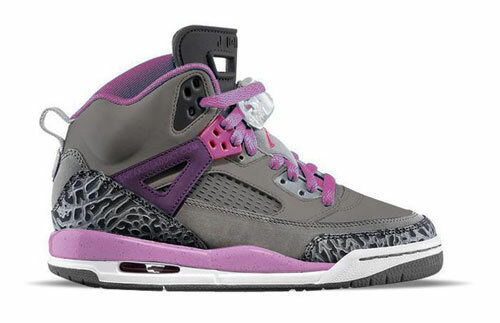 Another Jordan Brand release the ladies can look forward to next month is this all new nubuck-based Spiz'ike featuring vibrant purple accents. The well-respected Jordan Spiz'ike returns exclusively in grade school sizes, featurning a premium nubuck build and elephant print detailing. Cool grey covers most of the nubuck-based upper on this Spiz'ike for the ladies, while purple earth adds some color pop throughout the upper. A subtle shade of pink combines with white and grey down below, taking care of the iconic AJ III tooling. The Cool Grey/Purple Earth Jordan Spiz'ike GS is scheduled to release December 8th at select Jordan Brand accounts nationwide.